1. 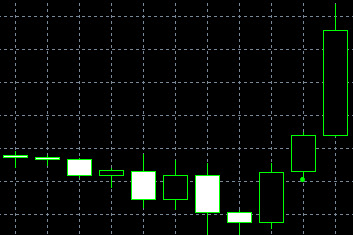 The engulfing pattern is formed according to the principle described above. 2. On the third day the Three Outside Up pattern is preceded by a higher closing price, while the Three Outside Down pattern is preceded by a lower closing price. These patterns reflect only valid scenarios of the corresponding engulfing pattern. Confirmation patterns cannot be more flexible than the basic ones. The degree of confirmation taken on the third day can influence the forecast ability of the basic pattern. The bullish Three Outside Up pattern can develop into the Hammer pattern, while the bearish patterns can become the Shooting Star pattern. The transformation is unlikely as the gap between the opening price of the first day and the closing price of the third day can be too wide, making it hard for the pattern to reduce to the Hammer or the Shooting Star. Importantly, colors of the transformed patterns correspond to their trend. 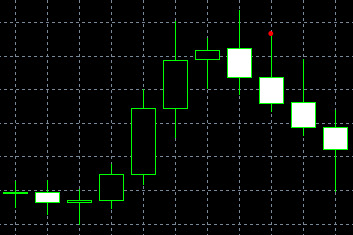 The Three Outside Up and the Three Outside Down patterns are of the same type as the engulfing pattern.